Initially devoted to the practice of Shi’a Islam, al-Azhar mosque is almost as old as Cairo itself. It was commissioned in 970 by the Fatimid Caliph al-Mu’izz, and was the first of the city’s many mosques. As the oldest Fatimid monument in Egypt, its historic significance is immeasurable. It is also renowned worldwide as a place of Islamic learning and is synonymous with the highly influential al-Azhar University. In 969, Egypt was conquered by General Jawhar as-Siqili, acting under the orders of the Fatimid Caliph al-Mu’izz. Al-Mu’izz celebrated his new lands by founding a city whose name translated as “al-Mu’izz’s Victory”. This city would one day become known as Cairo. A year later, al-Mu’izz ordered the construction of the city’s first mosque - al-Azhar. Completed in just two years, the mosque first opened for prayers in 972. In 989, the mosque appointed 35 scholars, who took up residence near their new place of work. Their purpose was to spread Shi’a teachings, and over time, the mosque became a fully fledged university. Famous throughout the Islamic Empire, students traveled from all over the world to study at Al-Azhar. Today, it is the second oldest continuously run university in the world and remains one of the foremost centers of Islamic scholarship. The mosque earned its status as an independent university in 1961, and now teaches modern disciplines including medicine and science alongside religious studies. Interestingly, while the original Fatimid Caliphate built Al-Azhar as a center of Shi’a worship, it has become the world’s most important authority on Sunni theology and law. Classes are now taught in buildings constructed around the mosque, leaving Al-Azhar itself to uninterrupted prayer. Over the course of the last millennium, Al-Azhar has seen many expansions, renovations, and restorations. The result today is a rich tapestry of different styles that together depict the evolution of architecture in Egypt. Many of the world’s most influential civilizations have left their mark upon the mosque. The five existing minarets, for example, are relics of different dynasties including those of the Mamluk Sultanate and the Ottoman Empire. The original minaret is gone, a fate shared by most of the mosque's original architecture except for the arcades and some of the ornate stucco decoration. Today, the mosque has no fewer than six entrances. Visitors enter through the Barber’s Gate, an 18th-century addition so-called because students were once shaved beneath its portal. The gate opens out into a white marble courtyard, which is one of the oldest parts of the mosque. From the courtyard, three of the mosque’s minarets are visible. These were built in the 14th, 15th and 16th centuries respectively. Visitors are allowed to enter the adjacent prayer hall, which is home to a very fine mihrab, the semi-circular niche carved into the wall of every mosque in order to indicate the direction of Mecca. Much of the mosque is closed to tourists, including its magnificent library, which houses volumes dating back to the 8th century. 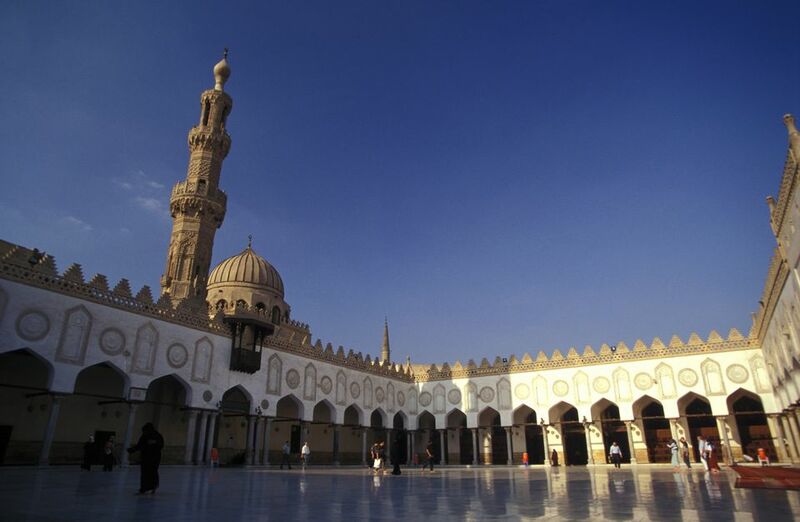 Al-Azhar Mosque is located at the heart of Islamic Cairo, in the El-Darb El-Ahmar district. Admission is free, and the mosque remains open throughout the day. It is important to be respectful at all times within the mosque. Women should wear clothes that cover their arms and legs, and are required to wear a scarf or veil over their hair. Visitors of both sexes will need to remove their shoes before entering. Expect to tip the men looking after your shoes upon your return. NB: Please be aware that the information in this article was correct at the time of writing, but is subject to change at any time.